This series features Lee McKinney Woodyard, her Aunt Nettie, and TenHuis Chocolade. Lee manages the store for Nettie. In this edition Lee finds an old trophy while cleaning out their storage garage. She can’t wait to share it with her Aunt. She found it at the perfect time since Nettie was hosting a reunion for her old high school singing group, The Pier-O-Ettes, the group that won the trophy. But the trophy didn’t get the reaction Lee had expected. It seems to have brought back some terrible memories. The trophy was won at the old Castle Ballroom on the very same night that the ballroom owner was found shot to death. It was ruled a suicide but his wife didn’t believe that and neither did several other people. There were always questions about what really happened that night. The reunion and the trophy brought the whole event back to the forefront. Just how much does Aunt Nettie know? Before Lee can even wrap her head around what may have happened in the past someone turns up murdered in the present. Are these events connected? Well you know Lee is going to find out and put herself right in the middle of the sticky mess. This series is one of the first that made me fall in love with cozy mysteries. Set in a chocolate shoppe, full of tasty goodies, how could you go wrong? The author is an expert at writing this genre. We fall more for the main characters with every installment and they just continue to put themselves in harms way. We keep turning the pages to make sure everyone is safe and settled by the final word. This story had a lot of additional characters due to the Pier-O-Ettes reunion and they added even more drama to quaint town of Warner Pier. It was a very entertaining story. A delectable treat for the mind. The chocolate treats I consumed while reading it were an absolute must. I am proud to say I am a Chocoholic and these stories feed my craving perfectly. Well, maybe not! I tried joining this site and got a message that webpage cannot be found. Arrrrrrgh. Should be working now, saw on the forum there was an upgrade being done. 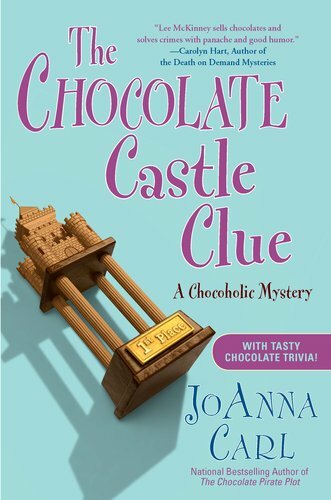 Any book that requires chocolate is a must read! I will have to put this series on my ever growing, ginormous wish list! And I think the new page looks GREAT!!!! Yummy a book set in a chocolate shoppe. Sounds like a great story.